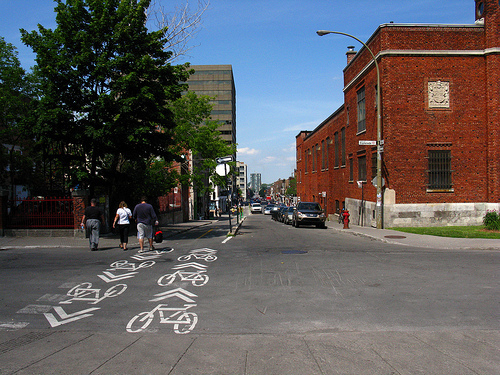 It's less risky to ride your bike on cycle tracks, like these in Montreal, than on the street. Photo by Andrew Bossi. The Natural Resources Defense Council’s Smarter Cities project identified the top 15 metropolitan regions in the United States that are leaders in “transportation innovation and smart transit.” The study, created in collaboration with the Center for Neighborhood Technology (CNT), examines the affordability, availability and use of transportation in small, medium and large cities, using metrics from the U.S. Census and CNT’s Housing and Transportation (H+T) Affordability Index, which looks at household transportation costs by location. Some of the cities and regions that “foster compact, walkable, transit-rich communities” include New York City, Honolulu and Lincoln, Neb. The report is not without its limitations: Kaid Benfield, director of Sustainable Communities & Smart Growth at NRDC, says he would have liked to see more data on how regional performance is changing over time, as well as a greater discussion on streetcar initiatives. The full study, along with profiles of individual cities, can be found here. A study conducted in Montreal, a city with an established network of cycle tracks, compared bicyclist injury rates on cycle tracks versus in the street. The data suggested that “the injury risk of bicycling on cycle tracks is less than bicycling in streets.” So keep building those bike lanes! For more information, read the abstract and download the full study. Does New York City’s transportation unfairly favor Manhattan? The Center for an Urban Future released a new study, “Behind the Curb,” that shows how a “disproportionate share of the city’s recent job growth, transit ridership gains and population increases have occurred in the four boroughs outside of Manhattan, but transit service in the boroughs has not kept pace—and the biggest losers have been the city’s working poor.” (TheCityFix wrote about a similar study by the Pratt Center for Community Development.) The report suggests that implementing components of bus rapid transit (BRT) systems, like pre-paid boarding and real-time arrival information, could be the “cheapest way to bring rapid transit to more neighborhoods outside of Manhattan.” To read more about how workers in Staten Island, Queens, Brooklyn and the Bronx could benefit from more investment in bus improvements, read this summary by Streetsblog reporter Noah Kazis (a former blogger for TheCityFix) or this analysis by Benjamin Kabak on 2nd Ave. Sagas. As infrastructure budgets shrink in the U.S., the Brookings Institution calls for more focus on state decision-making around transportation funding in a new paper, “State Transportation Reform: Cut to Invest in Transportation to Deliver the Next Economy.” Robert Fuentes, senior fellow at the Metropolitan Policy Program of the Brookings Institution, says America’s current transportation system is “broke and broken.” He offers three recommendations to fix it. To learn more, read an interview with Puentes in Streetsblog, or download the full paper here.